I began practicing yoga 20 years ago as a form of exercise. I started out with a couple of videotapes, and then began attending various yoga classes throughout the Boston area. I found I really enjoyed and connected with the non-competitive, meditative, and ultimately spiritual aspects of the practice. I was also fascinated by the connection to Eastern religious/spiritual tradition, especially the music and practice of kirtan. The teachings and practice of yoga have played an important role in my personal/spiritual growth, which continues to this day. After recently becoming ordained as an interfaith minister and leaving my job as a school guidance counselor, I am currently working on “Supporting Life’s Journey,” helping people reconnect with their truest, most authentic selves through events, workshops, spiritual coaching, etc… with a primary focus on using sound and music as a way to support healing, evolution, and community building. 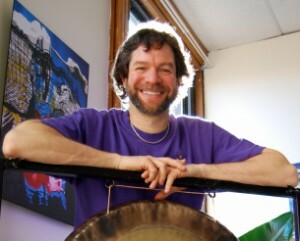 Facilitating kirtan, sacred song events, drum circles, sound meditation, gong journey and dream work, various support groups, yoga practices (laughter yoga and yoga nidra), etc… as well as co-creating with other teachers/facilitators, gives me a wonderful opportunity to continuously learn, grow and share my talents and passions with others. I am very fortunate to be able to incorporate yoga (as well as many of my other spiritual practices) into my career and daily life. Being able to utilize my training and passion as a musician, counselor, minister, teacher and facilitator in the service and support of people’s personal and spiritual growth is indeed a blessing. 4. How do you feel supported by the Lila yoga community? I am personally very thankful for the openness, support, and sense of community that Lila provides.